Woodman here, hello to everyone. I can be such a slacker sometimes.. I signed up to this forum months ago and Im just now getting around to intruducing myself. Anyways, Im Woodman. I live in the beautiful, and very dusty, state of Arizona. Of course I know AZscoob, I fondly refer to him as my beer sensai. He also just happens to live a couple blocks away from me. He is responsible for getting me back into brewing after messing around with the Mr. Beer setup for a couple years with only minimal success. He taught me AG brewing on his rig and helped foster my habit until I got my own setup. I have been brewing AG for a couple years now and I love it! Im brewing 5-5.5 gallon batches in a modified keg brew kettle. I have a couple mini fridges with digital thermo controllers in my garage, using glass car boys for fermentation. I go straight to keg when the beers are ready, using good ol' ball lock corny kegs. Last but not least, I serve my brew from a 2 tower, 3 tap, double door beverage air kegerator that I found on craigslist for a smoking deal!!. Lets just say it needed some work..
Im glad to finally get my introduction done and I will try to be better about getting on the forum and helping to build content. Hope to get to know you guys better! welcome to the forum. post some pics of your set up when you get a chance! we love shiny things here. Hey, I have this engine block, and pistons, rods, crank, bearings etc. maybe Monday or Tuesday, we assemble this thing, have a few pints. Welcome to the site Woodman. I'd love to see some pics of the your gear. If you dont mind me asking, if you have a keg based brew rig, why do you do 5 gal batches most of the time? Ask away Lakewood. I usually make 5 gallon batches just for ease of brewing because I dont have a pump so double batches tend to get a bit difficult to lift and move around. Thanks for the warm welcome fellas! 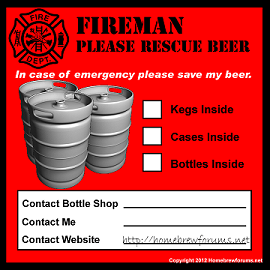 I will post up a link to my photobucket "beer stuff" folder with pics of my brew gear. I will go ahead and place these right here for you viewing pleasure..
Man, you know Im down with that! You let me know when you are ready and I will arrive with large quantities of frosty refreshment!! Thanks for sharing I'd love to have a serving system like that. very cool. Do you have a ferm chamber? What do you use for fermentation vessels? I use 2 mini fridges with digital temp controllers for fermentation chambers. 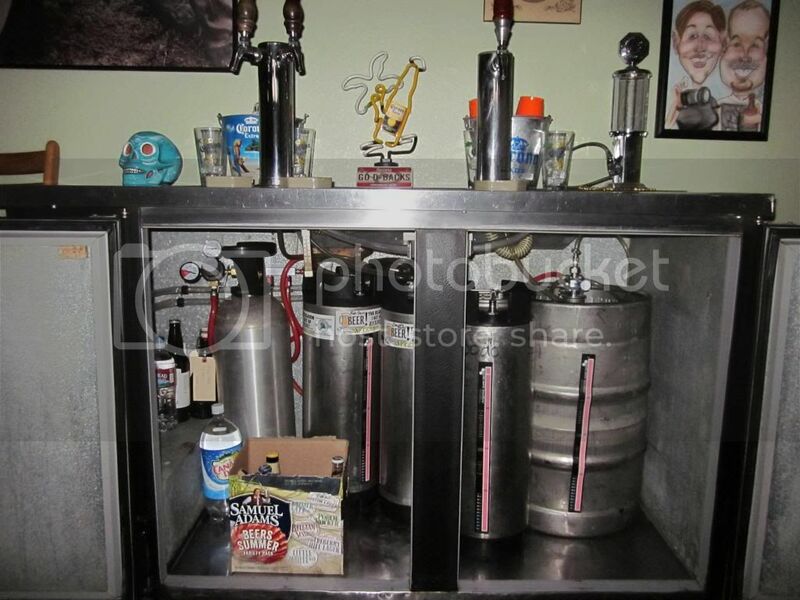 In the post with the pics of my keggerator, right above the pics is a link to my photobucket "beer stuff" album with pics of all my brewing equipment. Well, except for my blichman burner as I just got that recently.. I remember driving out to nowhere to pick that thing up, killer deal on it too! just checked out the link. thats a bucket full of awesome right there. Thanks guys, it was a labor of love! 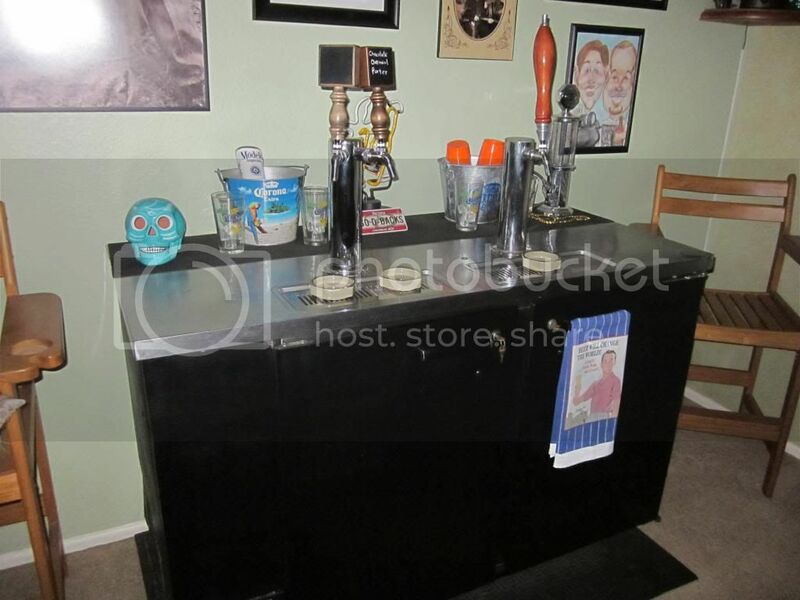 I found my keggerator on craigslist and talked the guy down to $300! It was a bit banged up, but mostly just needed some TLC. I replaced all the beer lines, put in new door seals, rebuilt both lock assemblies, re-routed the drip tray lines + condensor drip lines to a vessel inside the chamber, fixed a bent door hinge that was causing a gap and not letting the temp get lower than 40f, replaced the condensor drip tray, added perlick forward sealing faucets and finally put a new tecumpsuh compressor in it last summer. BEST. PROJECT. EVER! Plus my wife thinks its awesome as well, which as any of you married folks can atest to, is a very good thing! The whole reason I was set on getting a comercial grade keggerator was the ability to purchase pretty much any part I would need to keep it going. An added benefit is the ability to store an obscene amount of cold beer..Of course it helps that AZscoob knows almost EVERYONE, he has a buddy he introduced me to that actually repairs these types of keggerators and bar refidgerators for a living, which has helped more than once..